Since Fingercheck’s founding in 2013, we’ve had our sights set on building the most intuitive, user-friendly, and customizable HR software on the market. During this time, we’ve received lots of meaningful feedback that has helped us perfect our product and deliver a better solution for you. Among those comments was the request for Fingercheck to modernize and update to a newly designed user interface. We’re excited to announce that we’ve heard you loud and clear, and have been redesigning every aspect of our software for a better user experience. Take a look at the new Fingercheck. The new Fingercheck uses the same functionality as you know, only with cleaner and simpler visuals. Here are just some of the changes you should be aware of. Full Screen Layout – The software is now on a full screen on your browser and all the main menu options that used to be at the top of the page are now on the left-hand side of your screen. We’ve also added dashboard graphics to provide you with daily metrics that inform you at a glance. Employee Search – Within the employee tab, you’ll notice that we’ve added a universal search bar, making it much easier to quickly locate any employee. New Live Status – We’ve now created a more dynamic Live Status view that’s color-coded to indicate whose punched in, out, and not punched at all. Less steps – We’re making Fingercheck more efficient by eliminating unnecessary steps, such as clicking Apply and Save. Now, you just need to click Save. Improved GEO Live Map – We’ve also updated the GEO Live Map so that you no longer have to go through Live Status to launch the GEO Live Map. Simply navigate to it from the Time & Labor Tab. Plus, we’ve added new icons! New Dashboard Icons – You can now easily manage messages, notifications, company announcements, employee directory, etc. in the top right corner of the dashboard. Edit employee profile from any tab – One of the best changes to the software is the ability to access an employee’s profile from any tab. 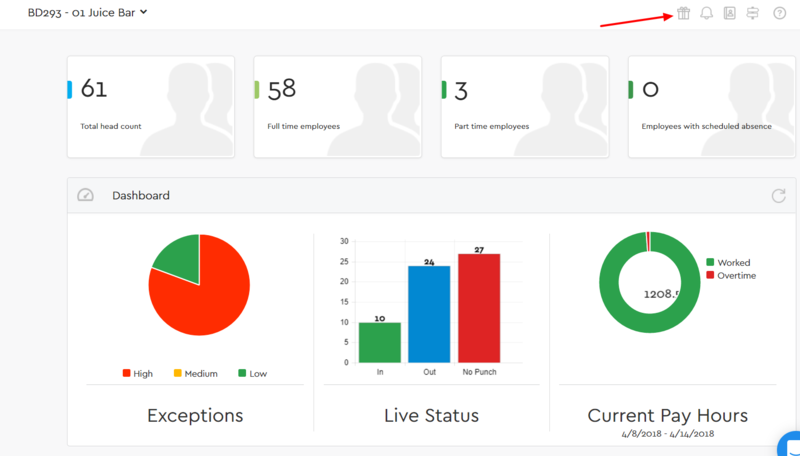 Simply click the employee’s photo icon to view and edit the employees profile without leaving the tab you’re working on. Redesigned Payroll Dashboard – Our payroll clients will be excited to know that we’ve completely redesigned our Payroll Dashboard so that your payroll details are easily summarized, and you can spot trends in your payroll. Payroll Financing – If you’re low on cash flow and need a cash advance, you now have access to one-click payroll financing. These are just a few of the changes we thought you should be aware of. To get the full user experience, we suggest you dive right into it and switch to the New Fingercheck! When logged in, you can simply click on “Switch to the New Fingercheck” at the top of your screen. Being that we designed this with your experience in mind, we would love to hear your feedback and suggestions to make our redesign even better. For those who need further guidance on how to adjust to the new layout, you can reach out to our support team at 1-800-610-9501 for assistance. To keep up with all things Fingercheck, please follow us on Facebook, LinkedIn, and Twitter for real-time updates.